As you all know, I just LOVE chickens!!!! I use any excuse, to crochet one! But speaking seriously, battery farming, is subject which breaks my heart. These poor, beautiful, and above all, intelligent creatures, are kept in absolutely VILE conditions. If dogs or cats were subject to the same torture, there would be a global out-cry. But, because these amazing, unique ladies, provide us with cheap eggs, a blind eye is turned. After a short and brutal life, confined in a tiny metal cage (they never see/feel sunshine or daylight, or ground beneath their poor crippled feet) they are sold for a pittance, to the meat market, for mass slaughter. 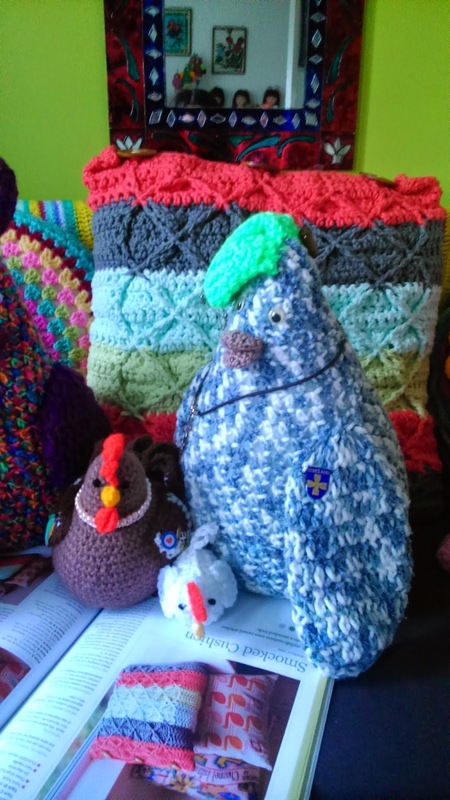 A few of the lucky ones, get saved, by chicken charities, and are re-homed. These ladies are in dire condition. Most are almost, if not totally featherless. 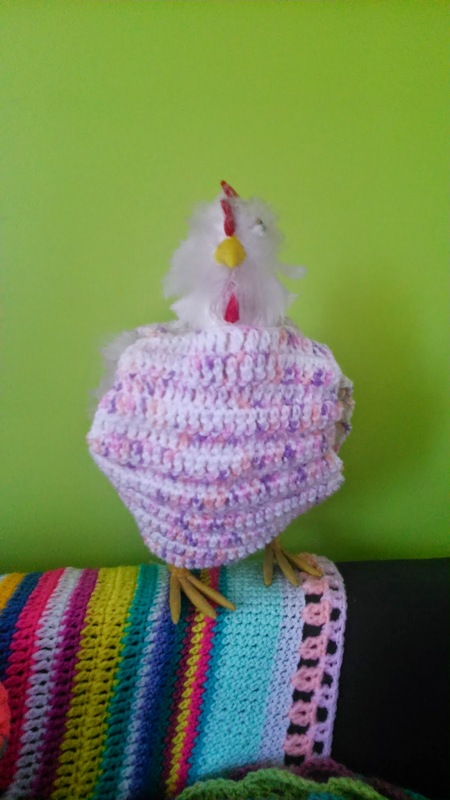 My little cluck-over is a crochet woolly top, which a hen can wear, while she is waiting to re-grow her feathers. 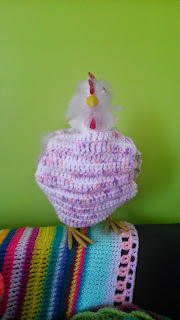 As I'm not blessed with any live chickens, my little artificial Frizzle has agreed to model the cluck-over, for me! Please note, diagram is not to scale. This pattern is graded as easy, but some prior knowledge of crochet, and crochet stitches is required. The garment is worked from the neck down, and consists of two identical pieces, sewn together, at the "shoulders". Some stitches are skipped. in the centre, to create the neck hole. The sides are left open, to accommodate the wings. It is secured at the base (on each side) with a button. 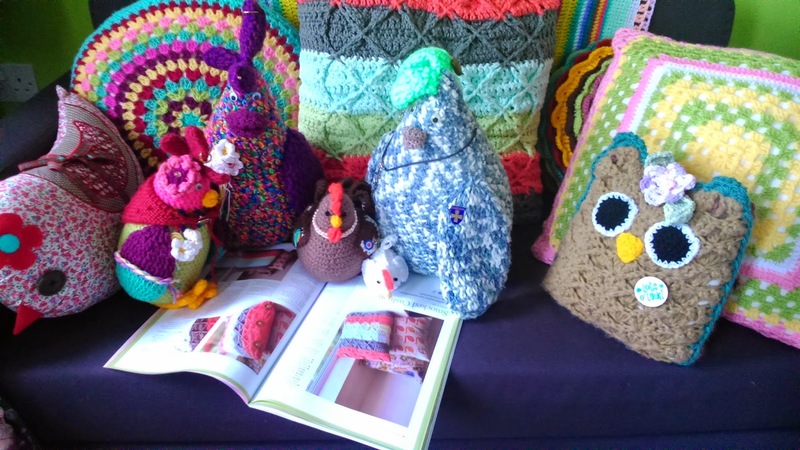 The pattern is written in British crochet terminology. The turning chain counts as a stitch. DK yarn (100 gm ball should make 3 to 4 garments) you may use yarn oddments, crocheted together. The possibilities/variations are endless! Row 3: 3ch, tr in each st to end. Turn. Rows 14-16 : Repeat row 3. At the end of the last row, 4ch, slst to base of last st on this row . Button loop created. Fasten off. Cut yarn. On opposite side, attach yarn with slst, at base of 1st on this row, 4ch, slst to top of this st. Button loop created. Fasten off. Cut yarn. 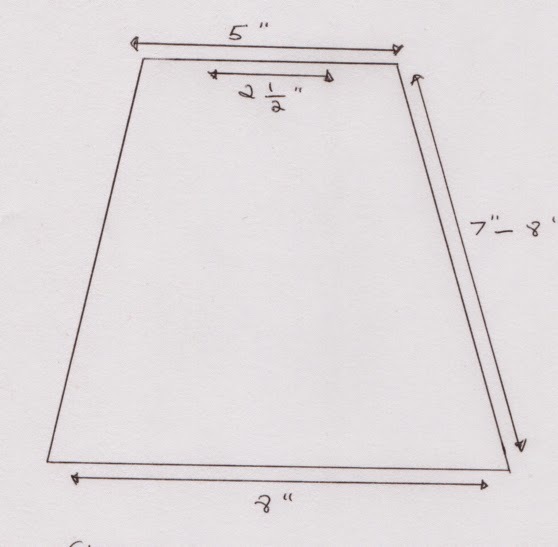 Turn the piece, so that the top (5" end) is facing you. Attach yarn with slst, in 1st st, dc in same st, dc in each of next 4sts (5dc). Cut yarn. Skip 10 sts. Attach yarn with slst in next st, dc in same st, dc in each of next 4sts. Fasten off. With RS facing inwards (not strictly necessary!) place both pieces together, matching up the corners at the top, sew inwards, across 5dc , skip 10 sts for neck, sew across last 5dc. 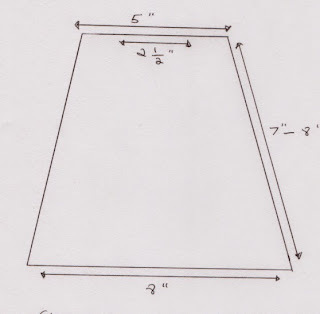 Designate one side as the "front". Sew a button on each end of the "back". Be sure, to use a button, which fits the loop, snugly, otherwise, it will come undone. Is this a cushion I see behind me? Any how, now for some egg-citing news! 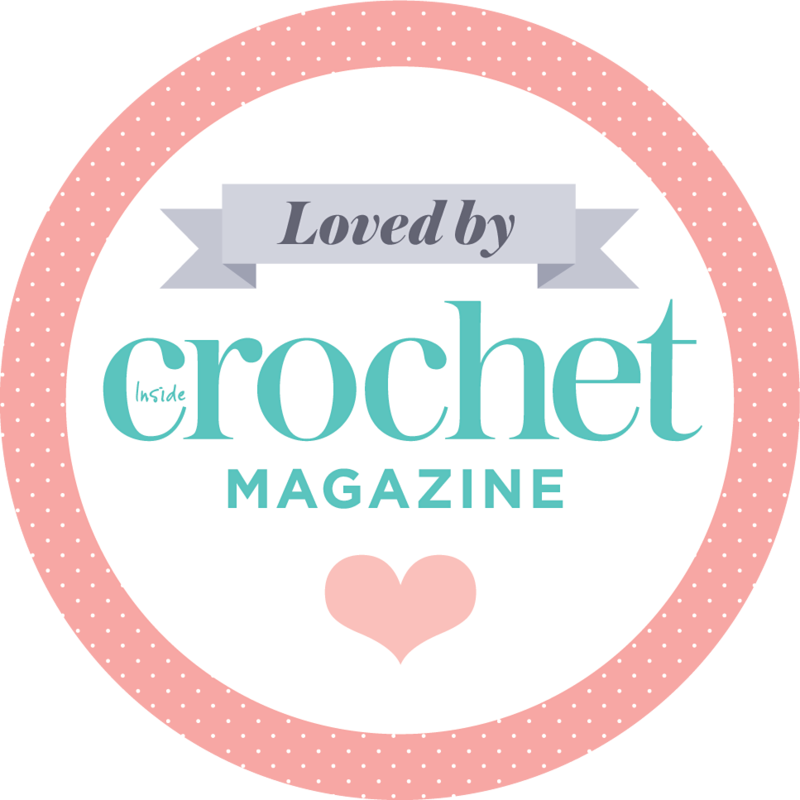 I've just had my 8th & 9th crochet patterns published in the wonderful magazine, that is inside crochet! 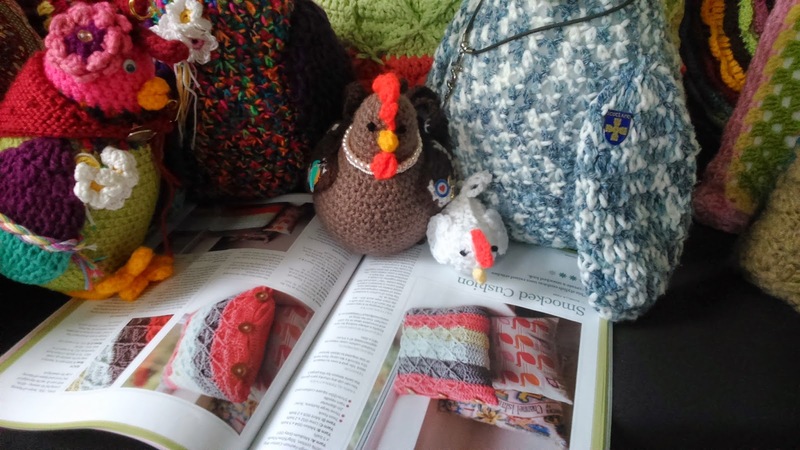 A smocked cushion, and my Hens of Happiness! 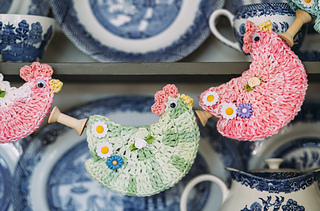 The hens had been taking to Clarice (my super model woolly cluck, who appeared in issue 54 of Inside Crochet magazine last year) and, they decided, while being a decorative garland, on my dresser, is very nice, they wanted more from life!!! They were as good as gold, and never clucked once! 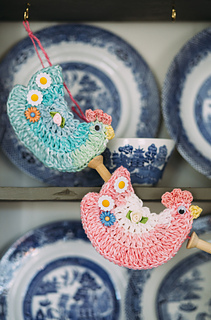 So, they hopped into a jiffy bag, clucking happily, and off to the post-office they went! 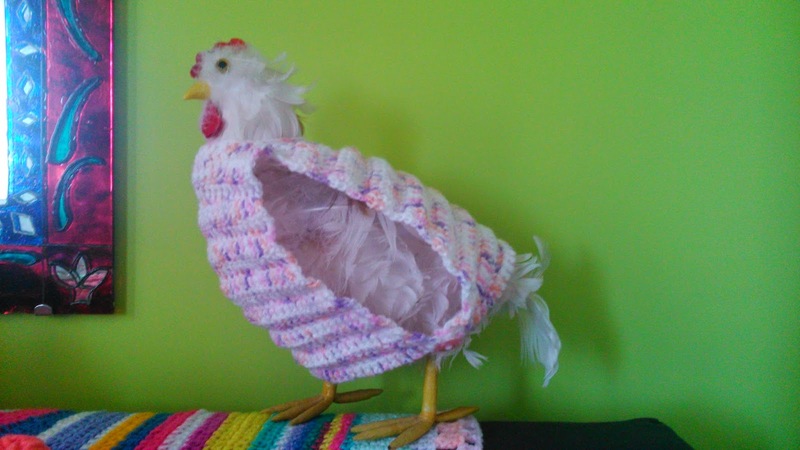 The woolly clucks also poured over the pages, clucking with pleasure, at all the lovely featured patterns. Tristan seemed rather confused, he was sure the cushion in the mag, looked rather familiar...Erm, yes, Tris, that is the very same cushion, you are resting against! Clarice: Sigh, I was modelling in this very same magazine (issue 54) only last year....How time flies! 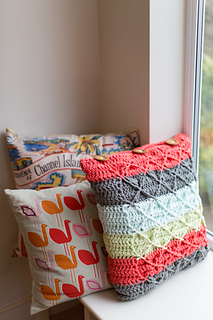 Official cushion pic, from IC magazine. 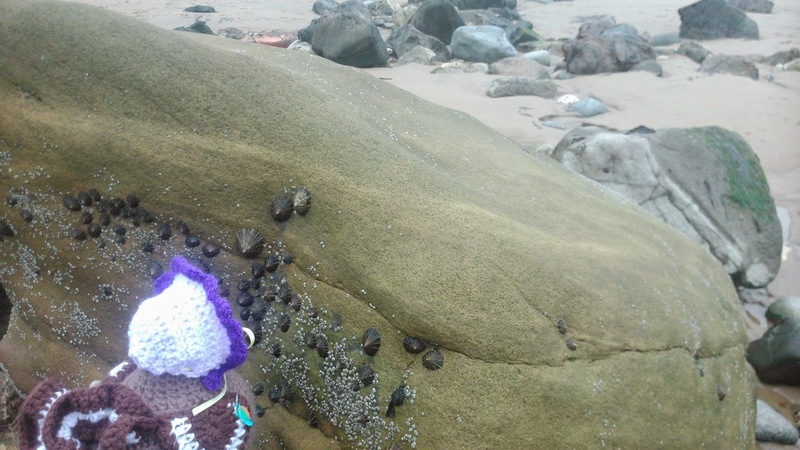 Limpets, seaweed, and a very sticky beak! A couple of weeks ago, it was a dull and windy Saturday (I hear you ask, what else is new?!) and neither I nor the clucks had been out for ages. I, on account of a rather nasty dose of flu, and clucks; well that was just due to general apathy and laziness!!! Anyhow, I digress. 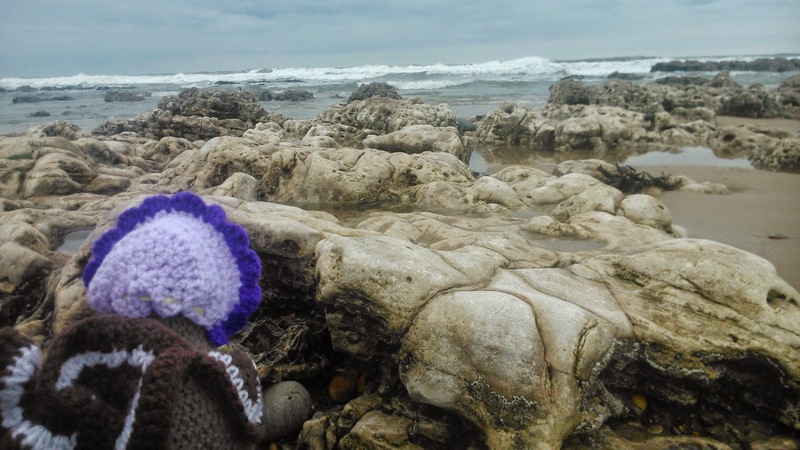 So,it was felt, a trip to the beach was in order, to blow the cobwebs away! 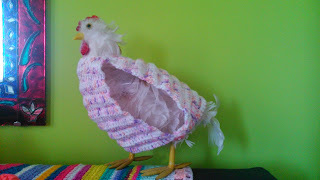 Blossom was getting her claws done (yes, these woolly clucks are very image concious!) Penelope was was busy making worm & sweet corn soup (Squawks, and Co were coming over for dinner). Tristan & Cecily were spending some rare quality time together, preening! Well, he has been away rather a lot, doing gigs with his band, and poor Cecily has been been feeling rather neglected. 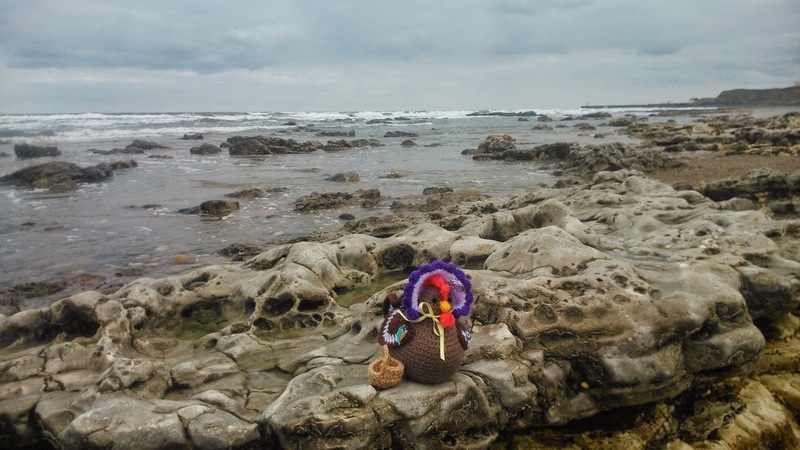 So, we all wrapped up warmly; Clarice made sure she donned her woolly but stylish bonnet, grabbed a basket for any foraged goodies, and off we went! Despite the dull grey sky, and freezing wind, the beach was wonderful!Nothing like the sharp fresh salty smell of sea air, to wake one up! We saw a flock of adorable plovers, some black headed gulls, herring gulls, and even a greater black backed gull (very large, and rather scary,to poor Clarice!). Mistress of all she surveys! DH & I wandered along the beach looking for old bottle tops (we found none!) 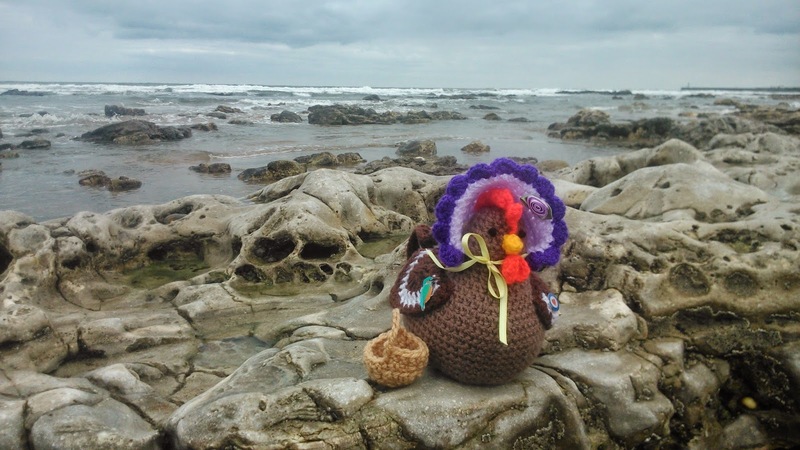 and Clarice had a whale of a time, or should that be cluck of a time, foraging! Beady eyed scrutiny, in progress! 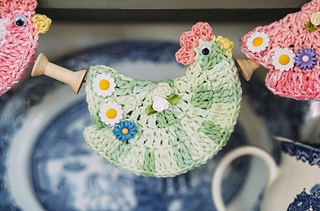 Now, Clarice had promised to bring back some goodies for the other clucks; hence the basket. And, she did collect some critters, but, on the way home, we heard slurping, and gulping sounds coming from the back seat, and by the time we got home, all that was left was a pile of empty shells, and one very sticky beaked woolly cluck!!! The weather has finally improved, and the sun is actually out! The trees are full of buds, ready to burst into leaf and blossom, and the garden is alive with bird-song :) In short; Spring is starting! 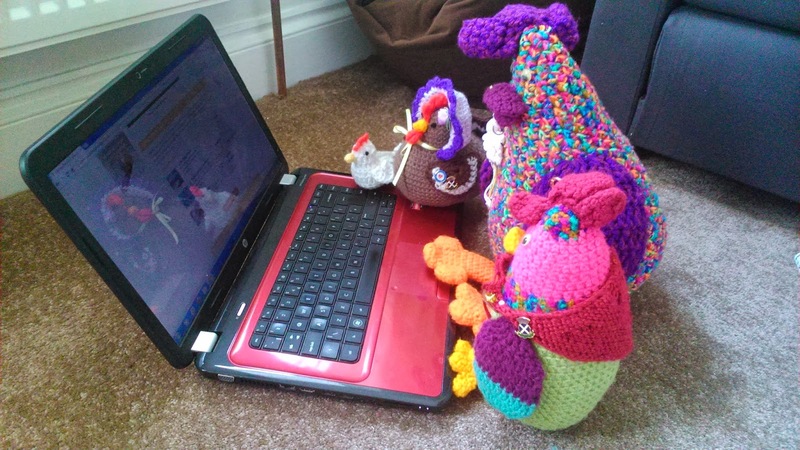 The woolly clucks have been feeling rather cooped-up and restless. On Monday, they joined me on the sofa, while I watched the new version of Poldark,http://www.theguardian.com/tv-and-radio/2015/mar/09/poldark-review-rugged-gorgeous-breeches-review on BBC I-Player. I don't know who sighed more; me or they! The scenery was absolutely breath-taking!!! The acting is very good,too. The characters are all very well fleshed-out. And the best part; there were three scenes, containing chickens, in the programme! Since then, the clucks (and I ) have decided, a holiday to Cornwall is a MUST! None of us, except Blossom, has ever been there, and that fact must be remedied. 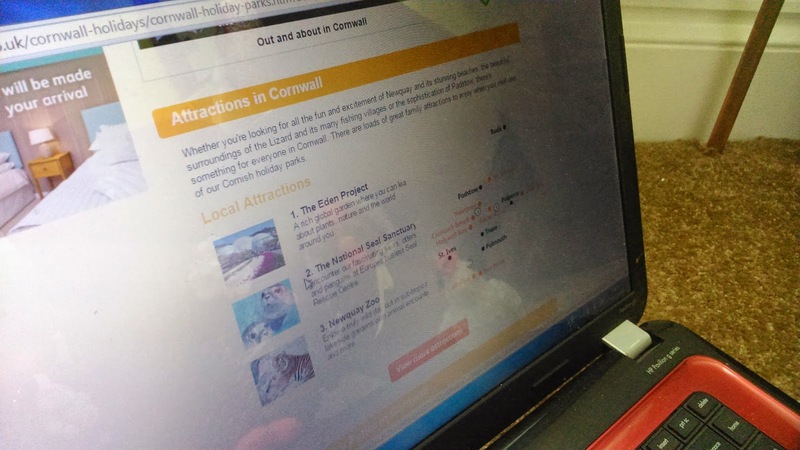 So, this morning, Cecily & Co have been Googling holiday parks/cottages, and trying to find a nice place to stay! 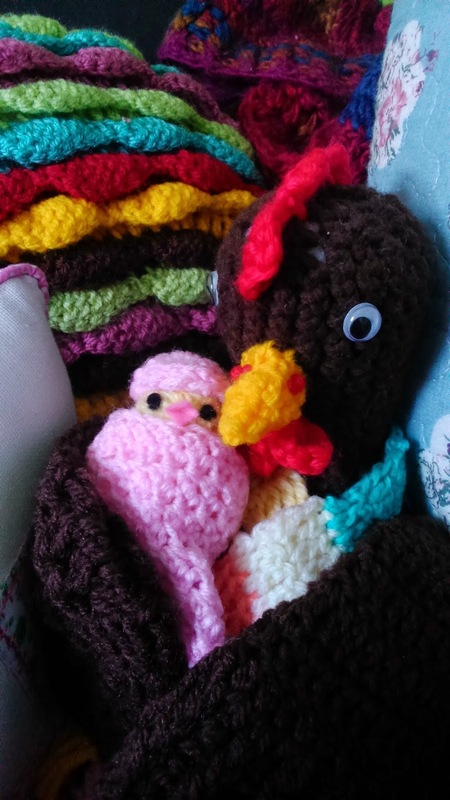 It has to be woolly cluck friendly, of course! LOL! 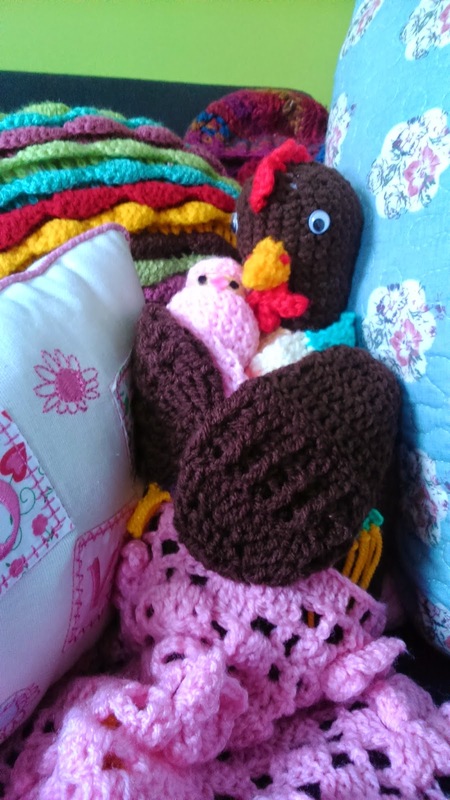 Lucky Blossom has already been Cornwall, when she stayed with the lovely Jo Barlow, and her gorgeous hens. She even went to St.Ives, for a picnic! Lucky cluck, she gets out more than I do! But, she says, she wants to see more of the area! The Eden project is a must see, especially for the clucks; it has a GREAT bug 'a'la'carte menu! Cecily, using the integral mouse! She is better at it, than I! Good morning! 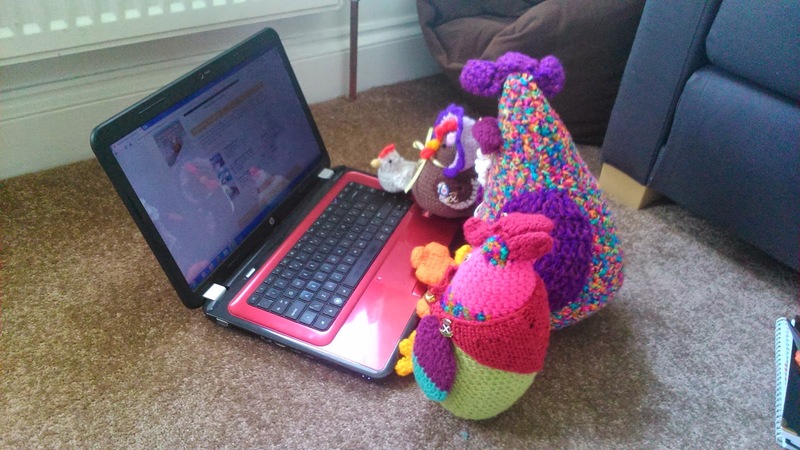 I have some wonderful news :) Now you all know dear Squawks (she is married to the dashing Septimus) and they have adopted darling little Milly, Molly and of course, Harry?! Well, earlier this month, Squawks laid an egg.... After much consideration and discussion, she and Septimus decided to "candle" it. Till, now, every single egg, had proven to be infertile. So much so, they had been discussing the adoption of another chick. A day out, with pal Cecily & the chicks! Anyhow, for the first time ever, the egg contained an embryo!!!! Squawks and Septimus were over-joyed, but also; very trepidatious. They decided not to say anything, to anyone. But, it was all worth it in the end :) The egg started to "pip" in the early hours of Valentine's day! And at 10.50 am, tiny little Ophelia Henrietta Velvet-Comb emerged!!!! 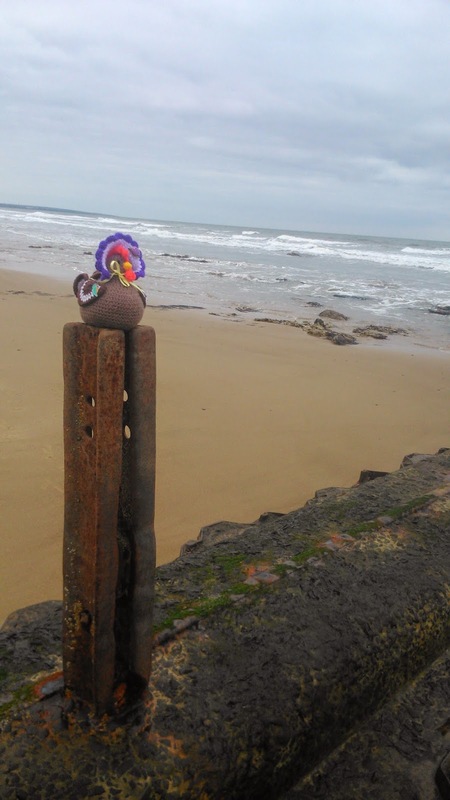 Squawks says, to date, this has been the most earth-shattering , yet the tenderest moment, of her life! Now, you may or may not know, tonight is Burn's night. It is a night on which the Scots traditionally eat neeps (turnips) and tatties (potatoes) and of course, the wee chieftain 'o' puddins...the haggis (plus a wee dram of whisky!). 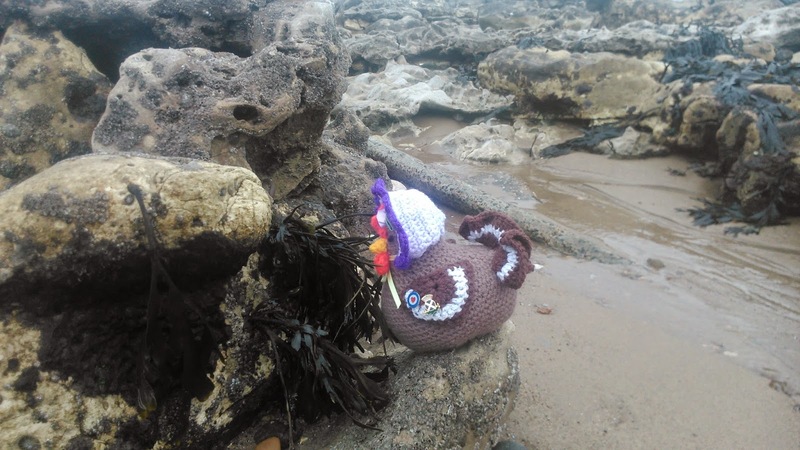 The woolly clucks, have heard tell, of tales of the haggis...a wild, hairy and elusive wee beastie!!! Well it was the one question everyone asked the clucks, during their time in bonny Scotland " Have you ever seen a wild haggis"? This was always followed by a big grin and a wink, though the clucks never knew why, they just assumed it's a "Scottish thing" and left it at that. Tristan is currently on tour with his Heavy Metal band Entrails, and so Cecily his beloved is rather at a loose end. Blossom has been feeling really bored and cooped up all day, and Clarice, well, she never turns her beak up at a potential adventure! Blossom, in the viburnum bush, scouring the horizon...is that a haggis flying past? No! it's a jackdaw! A you in there, wee haggis?! Er, Blossom, that's Brian's wood-pile!!! No, he's not in the compost, but I see a yummy worm! Right! That's it! He must be in the bug box!!! Now, between you and me, I just haven't got the heart, to tell the poor clucks, that a haggis is a sheep's stomach, stuffed with offal, and barley and herbs....LOL! All the Clarices (& one Clarence) in the world!